When I was a teenager, I used to accompany one or more of my family members in our trip to Bushehr, an Iranian southern city on the northern coast of Persian Gulf and the birthplace of my parents. The six-hour drive from my city Shiraz was always very exciting to me as the road wound its way through long and deep valleys and green mountains. My fondest memories of those trips, however, relate to a remarkably delicious on-the-route food that we used to have at a very special location called Banoo Teahouse. Banoo’s main clientele were truck drivers, an indication, we were tipped off, of serving quality food. The building itself was bare and basic with no outstanding setting or scenery; only a few metal folding chairs and tables and a couple of portable fans to push back the heat and flies. There was no attempt in decorating the place and indeed none was needed. The look of the juicy and golden fried whole chicken placed on the table emanating turmeric, black pepper and pleasure and the heavenly smell of steam-cooked Persian rice which came alongside the stuffed chicken was all the promise that Banoo could possibly deliver to our empty stomach. Over the past couple of decades of living outside Iran, many times I have attempted to “re-construct” Banoo’s stuffed chicken as its memory is still with me. What follows is the closest I have gotten to the dish. My culinary method and even the ingredients are not the same as Banoo’s I am positive, but the end result is pretty much similar. One whole skinless boneless chicken breast (fresh). This video shows you how to debone a whole chicken breast. Do not cut into two halves as the video does though! Two medium onions, thinly sliced. Two medium potatoes, skinned, washed, cut into small cubes, rinsed and pat dried. For marinate: ½ teaspoon, curry powder. 2 tbsp. olive oil. 1 tbsp. Turkish pepper. 1 tbsp. fresh lemon juice. ½ teaspoon turmeric. Salt, as desired. Rinse and pat dry the whole breast chicken. Place it between sheets of wax paper and gently pound to thicken it a bit. Set aside. To make marinate mix, use a medium size bowl and whisk in all the “marinate ingredients” noted above except lemon juice. Place chicken in the bowl, mix well, cover and let stand in the fridge overnight. On the day of cooking, to make the stuffing: heat 4 tbsp. oil in a large non-stick frying pan over medium heat. Add the onion in two or three batches and fry until golden. Check out this post for a glittering golden fried onion! Remove fried onion from the oil and set aside in a bowl. In the same pan, fry potato cubes over high heat until crispy. Transfer the onions back in to the pan. Add ½ teaspoon turmeric, pinch of salt and black pepper and stir & fry for another two minutes. If you still have too much oil left in the pan, transfer the potato/onion mix into a metal colander for an hour. 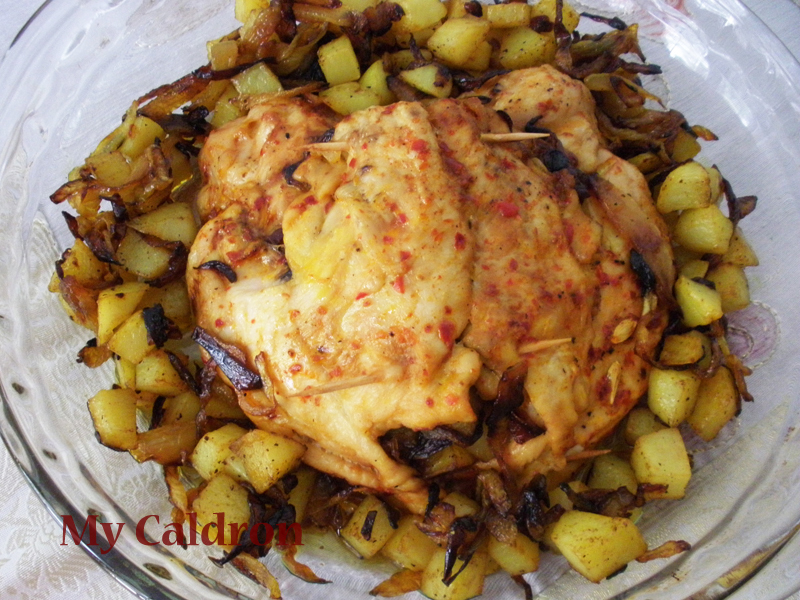 Remove the chicken breast from the marinate mix and lay down on a cutting board, inside up. Pour lemon juice over it. Preheat oven to 350 F. Transfer the wrapped chicken in a pan and brush with olive oil, sprinkle more salt and black pepper. Roast in the oven for 45 minutes or until it feels firm and cooked and the surface is sufficiently browned. Just about 10 minutes before the chicken is done, add the remaining of the stuffing around the pot. We want to devour all the stuffing even though the chicken breast had not enough room to contain it all. Let’s try this in the loving memory of Banoo and all women breadwinners of rural Iran on this International Women’s day! 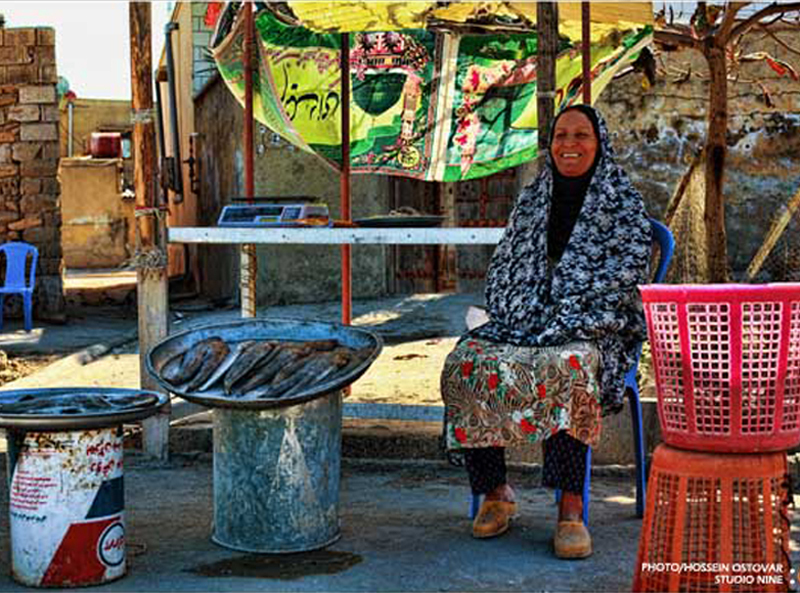 The picture, NOT of Banoo, is taken from the internet and shows a woman fisher from Bushehr region.